I downloaded the AgingBooth app on my iPad and created an image for each student, being sure to save each one to my camera roll. While I had each student come to me individually, other students were busily working on the writing piece on a piece of paper that their teacher had given them. 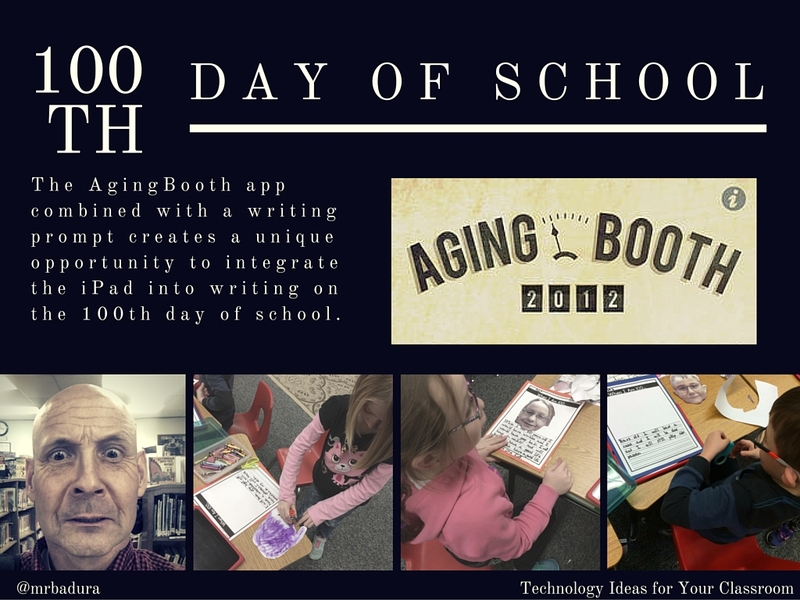 The writing prompt was, "When I am 100..."
When I had created an image for all of the students, I created a new folder in Google Drive. I then uploaded each of the images into the folder. I shared the folder with the classroom teacher. We printed the pictures from Google Drive and had the students cut out their pictures so they would better fit on their piece of paper. Students pasted their pictures on their writing sheets. The students really enjoyed this activity! It was fun listening to all of the laughter in the classroom. It was such a fun and easy way to incorporate technology into a writing activity. I did most of the technology in this activity, but one could easily have students use the app, then post it in Kidblog or Seesaw.